I Tawt I Taw a Teflon Pan! 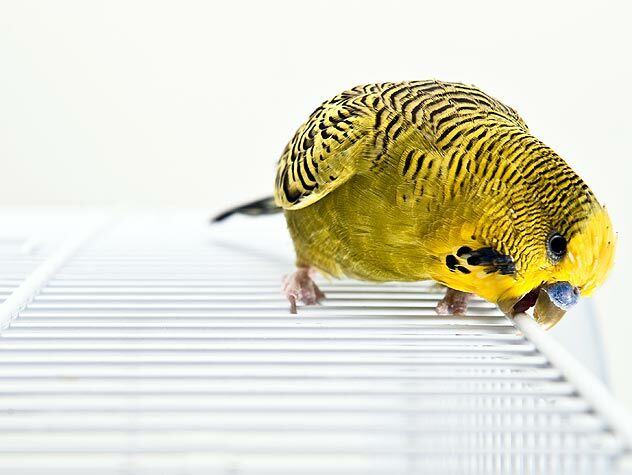 Puddytats aren’t the only source of danger for pet birds. Even a window can prove dangerous to a bird if he’s let out of his cage unsupervised. Adopters of birds need to watch their newfound friends like hawks; supervised playtime will keep the birds from getting hurt. Here’s a list to help prep your adopters for a few trouble spots; once folks realize that the most common things can be dangerous to their new pets, they’ll learn to think more creatively when looking for other potential hazards. Your hobbies: You may be a master craftsperson, but some of the glues used in craft projects produce fumes that are bad for birds. Be careful of model glue, too—your child’s “Build a B-52 Bomber” project may do serious damage to your bird’s health. The paint on your walls: If your house is an older model, the paint on the walls may contain lead. Be aware of where your bird’s cage is; if he’s too close to a wall, he may lean out and try to treat himself to a nibble of paint flakes. 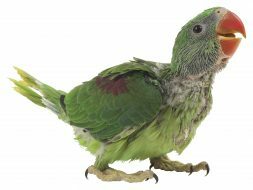 Your laptop, your VCR, your Tiffany lamp: Unless your bird is addicted to eBay or the Home Shopping Network, it’s not so much these objects themselves that pose the danger, but the electric cords that power ’em. Consider investing in a cord safety device. A plastic hose that encloses the cords can shield your bird from the shocking repercussions of her prying beak. The overhead fan: Moving objects overhead make birds nervous anyway, but the overhead fan is like a giant, slicing turbine to a roaming pet bird. Keep the fan off when your bird is out on a jaunt. That stylin’ antique birdcage: Some older birdcages have lead components; beware the seed-guard mesh in these decorative old attic behemoths—the lead in some of them can kill your bird. Your grandmother’s birdcage may complement your Victorian decor, but the dead bird won’t. Neither will the lingering bad karma. Teflon pans: If you cook with Teflon or other nonstick cookware, beware: The fumes from a sizzling pan can kill birds within seconds. If you’re grilling up a feast, move Tweety far away, crack a window, and turn on the kitchen fan. Your houseplants: Some of your plants may be poisonous to birds. Check with your vet about which plants you can safely allow Beaky to play “jungle bird” in. The innocent-looking kitty: She acts like she doesn’t notice the cage. She has no interest in the cage whatsoever. She would never dream of hurting that little bird. Duh. She notices. Don’t hang the cage where Precious will feel tempted and Squawky tormented. Even if your kitty has never been the drag-a-small-half-dead-animal-into-your-bed-at-three-in-the-morning type, maybe it’s because there’s never been a tasty morsel so accessible before. The potty: Yes, believe it or not, curious pet birds are lost every year to the evil mouth of the potty. Birds are interested in what their people are up to, and some bird lovers have discovered—a moment too late—that this interest extends to bathroom activities. Bob flushes, and two seconds later Beaky is in the bowl, swirling around, terrified, on his way to join those legendary sewer alligators. The lure of a water-filled sink or a bubbly pot of boiling water can also prove too tempting for Polly to resist. The moral of these terrible tales? Shut the lavatory door, cook when your feathery friend is safely in her cage and not peering over your shoulder—and keep an eye on your bird.